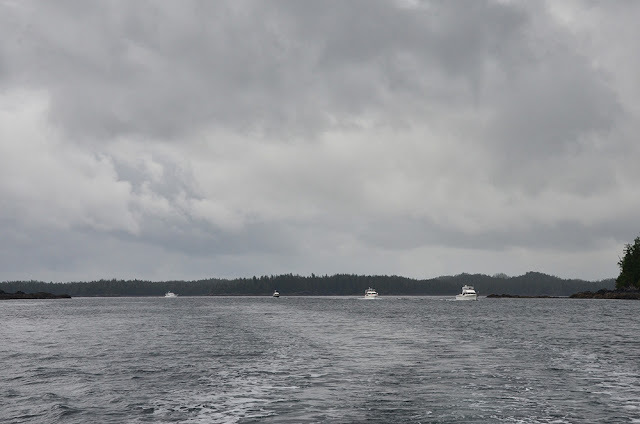 Today was a short day—28 miles out Seaforth Channel, up Reid Passage, and into Rescue Bay. But it was exciting! Soon after we exited Wigham Cove, one of the boats behind us radioed to say they hit something. They couldn't articulate where specifically they'd hit this thing, or what it was. A log? A rock? I instructed them to check the bilge for water (hint: if you hit something hard enough to radio me, check the bilge first). The bilge was dry. Then I had them run the boat up to speed to check for vibrations. Nothing until higher speeds, and even then they couldn't tell whether the vibration was new or not. They had spare props aboard, and we were just a few miles from Shearwater. 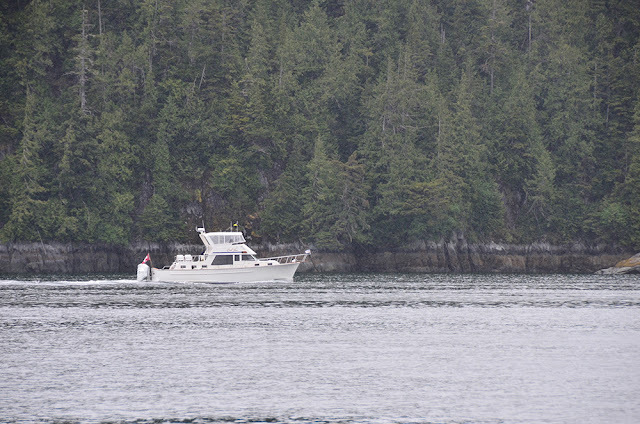 They opted to continue to Rescue Bay rather than return to Shearwater for inspection. Doll Face, owned by the owner of a commercial diving company. Thanks for diving! One of the participants on this trip owns a commercial diving company that specializes in in-water propeller and ship repairs. We're talking big stuff—cruise ships, oil tankers, etc. He had dive gear aboard and offered to inspect the running gear. After just a few minutes underwater, he surfaced and explained that all four blades on the starboard prop were damaged to varying degrees. Given the distance to Prince Rupert (the next place with haulout facility), the owner returned to Shearwater to have the prop replaced. Other than that, a pretty boring and very rainy day!